Leading supplier of delicious homemade cakes, traybakes and more! The Handmade Cake Company makes delicious wholesale cakes, traybakes, and scones by hand, for coffee shops and cafes across the UK and Europe. Whilst Diana’s original recipes are still used for some of our best loved cakes, we now have a dedicated team who develop new and incredible creations. 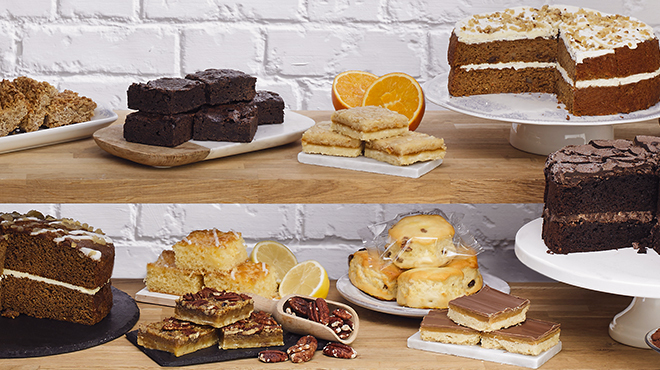 Our new bakes range from traditional to cutting edge but are always handmade and incredibly tasty. We now have a thriving bakery in Berkshire which has AA grade BRC certification and an experienced team of bakers and finishers who take huge pride in what they do. Though the number of cakes we bake has grown over the years, our batch size remains relatively small, and we’re careful to stay true to our handmade promise. Yes! Our bakery is full of familiar kitchen tools, but on a larger scale, allowing us to hand make all of our cakes for that genuine, artisanal look and taste. All our cakes are scratch-baked (we don’t use cake mixes) using ingredients you’d be happy to find in your fridge or larder at home. We don’t add artificial preservatives or colours and we don’t use fats that have been hydrogenated or things that have had their genes tampered with. We only use free-range eggs. Each cake is frozen, to lock in the freshness, and pre-portioned so our customers can defrost only as much as is needed, ensuring our cakes are served at their freshest, and reducing unwanted wastage. Not everyone is able to come and test our claim that we make our cakes by hand, so here's a glimpse of what we do at the bakery. In 2014, The Handmade Cake Company was bought by a French Group called Mademoiselle Desserts. The Mademoiselle Desserts Group offer the widest range of delicious, premium desserts, cakes and patisserie on the market. Our Maidenhead bakery is one of three Mademoiselle Desserts Bakeries in the UK, the others are in Corby and Taunton. Though the majority of our products are still created and baked in Maidenhead, the chefs at Handmade have benefited greatly from having three teams sharing skills and working together to create the best cakes on the market. We bake a truly enticing range of gluten free and vegan cakes and desserts. Your calls have been heard! We’ve baked a wonderful range of cakes and traybakes that also happen to be vegan. Perfect for broadening your appeal without compromising on taste as each cake is delicious enough to tempt everyone. Veganism is truly on the rise with the Vegan Society reporting that at least 542,000 Britons now follow a Vegan diet, that’s an increase of 350% over the last decade. Of these, 42% are aged between 15 and 34. Make sure your counter has something to entice them!